Rest in Peach was a nice sequel. As I was already familiar with the town and the characters it was easier to get into this book. It has a similar set-up as the first book with the big event planned which will take place towards the event of the book. So the progression of events and build-up was a tad similar to the first one, but the story was very differently, so I still enjoyed it. The peach touched to this story and the events in the book are a fun addition and just like the first book this one had me craving peaches. The mystery was a nice one, again a tad similar to the first book with the evidence pointing towards someone close to Nola and she doing her best to prove who really did it. I did like the mystery and it kept me guessing for awhile. I wasn’t too surprised when the truth came to light, but also wasn’t sure who had done it before the reveal, so that’s good. The characters have grown a bit on me since the first book, although I still don’t fully connect with them. I like Nola and how she’s always there to help her friends. And I liked the plotline with her setting up her own store and I am really curious how that will progress in the next book. I also liked the sub plot lines surrounding Nola her friends. I feel like we’re getting to know the characters in this small town a bit better and even meet some characters we didn’t see (much) in the first book. I quite liked Clara and there are some interesting reveals and plot lines involving some side characters. Then there is a hint of romance, which worked. Like most cozies the romance really stays a side plot, so it’s hard to fully get into it. After the previous book I had expected things to progress more in this one, but it didn’t move a lot. Cade and Nola have some troubles they need to figure out and things they need to tell the other. The peach element and focus of this series is one of the highlights of the books and it’s fun to see how the author weaved the topic of peaches naturally into everything. With Nola her peach shop, her parents their peach farm, their neighbour who makes peach drinks and then the Peach Cotillion with the peach themed touches. It’s just fun to read about it and it really made me want to eat some peaches. The small town setting and southern feel really came alive in this book. And with the focus on the debutante ball the southern atmosphere was even more present than in the previous ones. And I liked the debutante tips at the start of each chapter. To summarize: this was a fun and enjoyable book. The set-up of the story and the mystery is a tad too similar to the first book, but also different enough that I still enjoyed it. The mystery wasn’t too surprising, but also not too predictable, so that worked out well. It was fun to return to this town and characters and see how things develop in this book. There are some new side characters and interesting plot lines and developments involving some side characters. There is a hint of romance, but it stays a side plot. 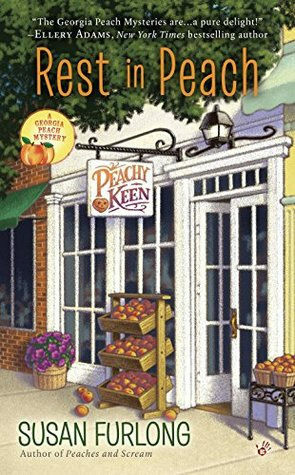 The peach touches and southern small town atmosphere are the highlights of this book and add a fun touch to the series. Have you ever read a fruit themed book or a book with lots of food references? The mystery was nicely done indeed, enough hints, but also not too obvious. And having the romance as a side plot in cozies works for me too. I don’t think I have read a cozy so far where the romance wasn’t a side plot. And I like it that way, I agree the focus should be on the mystery first and the other topics second. The peach theme is really the highlight of this book. Oh a strawberry festival that sounds fun too. Was that a cozy as well? I’ll go and check out that series on goodreads, it sounds like a series I would enjoy with all the food mentions ;). And a small town romance is always fun! I’m intrigued by this series because of the peaches. I think it’s such a neat element to the book. Too bad that it was similar to the first one. I read a paranormal a few years back and it was filled with everything blueberry. The overall plot progression and set-up was a tad too similar, but with the peach element it was still a fun read. I always like books that focus on food or have food elements! Keionda @Keionda Hearts Books recently posted…I MISS PHYSICAL COPIES…. I assume she does indeed, I have to admit this book has me appreciating peaches even more. I already made peach crumble a few times now. It’s hard to find a really surprising mystery. Here it wasn’t too predictable, but also not really surprising, which I usually call a win. oh this one sounds so charming. I don’t mind romance as a side as long as there is some element of it and there is a good ending. It sure was a charming book and having the romance as a side plot usually works great in cozies. There’s still a bit of romance, but also enough focus on the other topics. Yes that’s what I love about cozies, the characters always have fun hobbies or jobs or there’s this element like here the peaches that gets a lot of focus. It’s a lot of fun to read about. You get a glimpse into other jobs and hobbies. It was fun to read about this character setting up her own store. I quite like peaches, so now I usually stock up a can or two of peaches for when I want some. It’s interesting that the story/mystery seemed so familiar yet it wasn’t quite predictable, Lola. I’m glad you enjoyed your visit to this small town setting and that the characters are pretty well developed. It’s nice that you got a feel for what’s coming up in the series as well. The general plot and progression of it seemed to follow the same pattern or build-up as in the first book, but it wasn’t too predictable. It’s a fun series so far. It’s always fun to read a book with food references in them. This book was very food focused, which happens rarely, but I read quite some books with food references as well. Oh and I was planning to make the recipe you send me this week, but I realized my oats were expired. They smelled very stale, so i didn’t dare risk it. So now I bought new oats and hopefully can make the recipe this week.